It's less than two weeks until my kids go back to school.. but who's counting 😉?!! Please enjoy these new First Day of School Signs!!! They are 8.5x11" JPG files in grades K-6th. 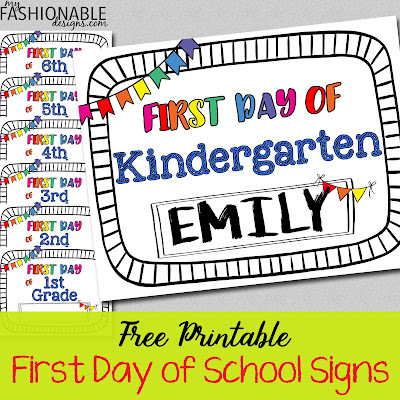 Check back again shortly because I have more 1st Day signs coming soon!!!!! 👉IDEA: If you're like me and hate your own handwriting, you could insert the image into a Word document and type in the name. Tag me on your Instagram pics! For your personal and classroom use only. Thank you for sharing these. They are soo cute and the best part... they are customizable! Have a great year! !